Firstly, an update on the potatoes from yesterday’s post. Last night’s dinner was simple but delicious – and the first decent meal I’d been able to eat for a few days thanks to a vicious gastro bug! 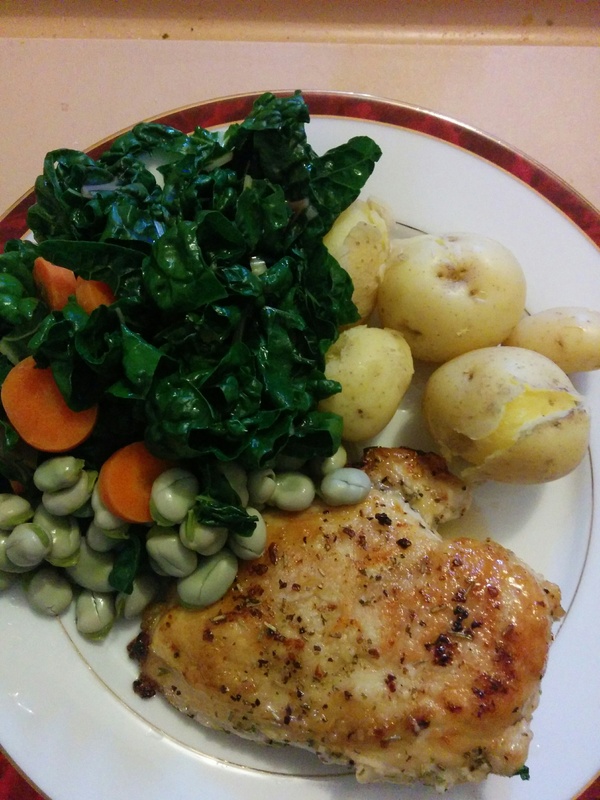 On the plate besides the chicken breast was the first of the broad beans, Pink Eye potatoes with fresh new season garlic butter and a lot of of lightly steamed silverbeet (aka Swiss Chard and possibly my favourite vegetable). Sadly, the carrot came from the shop, I didn’t have time to check the carrot tub out on the balcony. Today, my friend Karen and her daughter Georgia came round to visit and we had a great time, feeding the animals (we all got to cuddle Bernard Black Bunny) sharing lunch and playing board games. Karen and Georgia were my neighbours for almost seven years and though they only moved a few streets away a couple of weeks ago, I miss them dearly. It was brilliant just hanging out and laughing together. Board games are big in this house and we’ve managed to get quite a collection together over the years. Today we played a great little bluffing/card game called Sheriff of Nottingham and the wonderful Betrayal at House on the Hill, which is incredibly suspenseful and loads of fun. Meanwhile, I’m on the home stretch with a big essay. My deadline is tomorrow night, so I’m off to write as much as possible tonight (as long as it takes) and edit it all tomorrow when I’ve had some sleep. Sorry you have both gastro and a deadline. 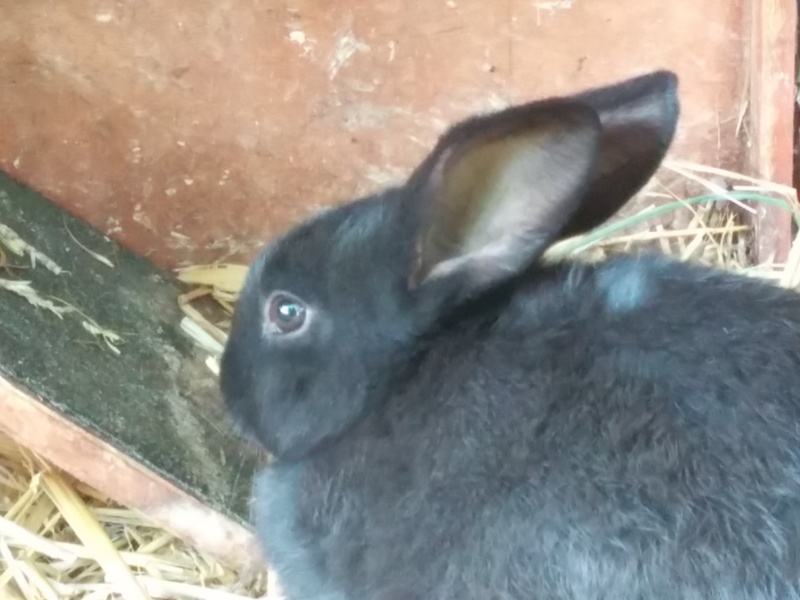 Hopefully your course has a bit of an hiatus over summer and you get a chance to kick back and relax with those gorgeous bunnies, your wonderful neighbours (well, ex, but still in the “hood”) and with lots of gorgeous home grown food to tide you over. The carrots will most probably be local (even the supermarkets source local carrots and spuds to cut costs) so that’s something. You are doing an excellent job of writing an interesting post a day. I doubt I could find enough to write about for a week let alone a month! Lol – it’s mad! I feel like I’m chained to my laptop, currently taking a break from finishing editing and referencing a 1500 word essay, listening to Brahms with cricket on the television – all the while dreaming about potting up tomatoes and cuddling Bernard. Talk about over-stimulation!! You aren’t bored though ;). We have 2 weeks of our course left and we are madly ensuring that we have assembled everything to hand in to our lecturer. Less editing and more assembling on our part. We piced up some tomatoes for our wicking beds yesterday. I stuck with small and medium varieties as who knows when it is going to be “Summer” here any more! Here’s to mature aged study, glorious home grown tomatoes and cuddly pets :).